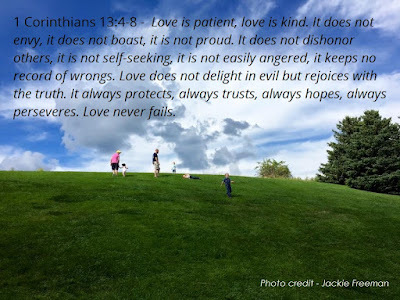 As I was thinking about what to write today, God brought to mind 1 Corinthians 13:4 . . . Love is patient, love is kind. It does not envy, it does not boast, it is not proud. These verses give us a very clear view of what love is, and shows us how to love our grandchildren in a way which points them to God. Love is not an emotion which comes and goes. It is not something which depends on how others treat us or how our situation looks. Love is a choice. Period. We choose to love others - no matter what, because this is how God loves us; no matter what. It is easy to love when everything is going well. When others love us. When life is "easy". But, when things get difficult, this is when love shows itself. When we choose to keep loving, no matter what. Love does not quit - even if others do, we make the choice to continue to love. This is love. This is how God loves us and how we need to choose to love others. This is so important for us to know as grandparents - we need to absolutely love our grandchildren when they are sweet and snuggly and when they may be stubborn and disobedient. A grandparent's unconditional and unwavering love is something which will give their grandchildren an opportunity to experience true love; and in so doing will give them a rock to hold fast to throughout their lives and an example to follow.